The first chapter argued for the educational significance of the emerging construct of adaptive teaching for student critical and creative thinking. 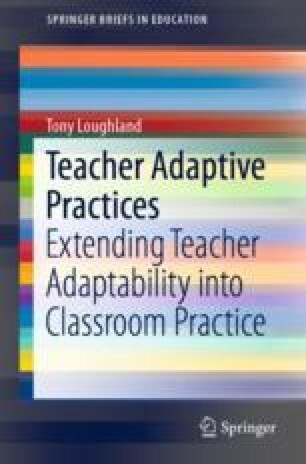 A conceptual model of teacher adaptive practices for student critical and creative thinking is presented at the beginning of this chapter. Next, the research constructs that constitute the personal, environmental and behavioural determinants of this model are critically examined. The outcome of this review is the hypothesis and research questions for this study. National Education Association. (2010). Preparing twenty-first century students for a global society: An educator’s guide to the “four Cs.”.. Retrieved from http://www.nea.org/assets/docs/A-Guide-to-Four-Cs.pdf. Parsons, S. A., Vaughn, M., Scales, R. Q., Gallagher, M. A., Parsons, A. W., Davis, S. G., … Allen, M. (2017). Teachers’ instructional adaptations: A research synthesis. Review of Educational Research, 0(0), 0034654317743198. https://doi.org/10.3102/0034654317743198. Webfinance Inc. (2018). Business Dictionary. Adaptability. Retrieved from http://www.businessdictionary.com/definition/adaptability.html.